Many types of diet pills are available. Although the main goal of each pill is to help a person lose excess pounds or control their weight, the way in which this goal is achieved differs depending on what the product has been designed to do. 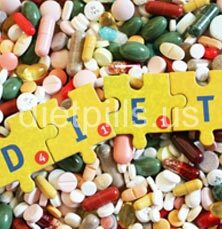 The following is a brief list of some of the different kinds of diet pills that can be found. Carb blockers – These types of diet pills prevent the body from absorbing a percentage of consumed carbohydrates, stopping the carbs from converting into glucose and fat. As a result, the body must rely on stored body fat to obtain energy instead of using the glucose that’s not there. Fat burners – Formulas designed to burn fat increase the body’s metabolism, enabling a person to burn off more energy and fat while boosting energy levels. These pills contain stimulants and may also include other ingredients that reduce fat absorption and/or increase muscle mass. Fat blockers – Target the digestive system and work by stopping the lipases in the digestive process from breaking down fat that is consumed, which prevents the fat from being stored in fat cells. As a result, as much as one third of the fat that a person ingests is passed through their system. By reducing the body’s fat storage, the body can then work on breaking down the fat it already has stored. Appetite suppressants –Types of diet pills that have been created to suppress the appetite work by stopping certain chemicals from being released in the brain that tell the body it’s hungry. Basically, these drugs trick the body into thinking that it’s not hungry, which means fewer hunger pangs and often a faster feeing of fullness. Diuretics – Also known as “water pills”, a diuretic diet pill increases the amount of water that is expelled from the body, which can lead to fast but temporary weight loss. PM diet pills – These particular types of diet pills have been specially formulated to encourage weight reduction while a person sleeps. They not only contain ingredients that are considered to be beneficial for losing weight, but also those that help to provide a person with a restful sleep. Various types of diet pill reviews provide you will different ways that you can lose weight. Some combine more than one method, such as fat burning and carb blocking, while others are designed to focus on a single process. Therefore, it is important that you find the one that is right for you, know how it will affect your body, and talk to you doctor before trying any product.